This book provides an overview and much useful advice on the crucial Buddhist practice of reflection, the skilful use of thinking. It is likely to be very helpful for many people in establishing and maintaining an effective reflection practice. It is also a delight to read. It is written with clarity and love, and is grounded in Ratnaguna’s own practice and experience. He also includes many interesting quotations from a variety of sources, both Buddhist and western, quotations which help elucidate the different aspects of thinking effectively and well. The book’s chapters take us progressively into the practice of reflection. The Introduction looks at the importance of the art and discipline of thinking, and how it fits into Buddhism. It clarifies the issue of how Buddhist wisdom goes ‘beyond’ reason but includes skilful thinking. It looks at the levels of wisdom – through listening, reflection, and contemplation – and the relationships between them. It then explores different dimensions of reflection, using D.H. Lawrence’s poem ‘Thought’ as a reference. Chapter One looks at how the quality of our thinking - how well we are able to reflect -depends upon our mental state, and in particular being still. It distinguishes between skilful and unskilful thinking, looking especially at ‘papanca’, or mental proliferation, as something to avoid. It discusses how both thinking and ‘not thinking’, i.e. meditative concentration, are each important, as well as exploring the importance of getting a balance between activity, meditation and reflection. There is an interesting section on the nature and inadequacy of words. Towards the end Ratnaguna gives crucial advice about the importance of having time doing nothing. He discusses the importance of developing the art of thinking about issues, such as ones own aging, from a Dharmic perspective. Chapter Two is about learning from personal experience, and how reflection typically involves personally important topics. It looks at reflection upon ones own personal characteristics and how developing such self-awareness is inherently challenging. It discusses the difficulty of seeing ourselves as we are, and the importance of the cultivation of positive emotions, and selflessness, in order to do so. In particular Ratnaguna discusses the importance of reflecting on negative states of mind, on owning up to our own foolishness, and on suffering, loss, and grief. Chapter Three is concerned with ‘dwelling on a topic’ - sustaining reflective attention on one subject. Advice is given on how to talk to oneself constructively, and on how to develop writing as a reflective practice, to help one think. Ratnaguna also gives other useful suggestions, such as ‘thinking with your legs’ and ‘reflecting with others’. He emphasises that reflection is a ‘deepening of the self’ and an enlargement of self-awareness. Chapter Four is about reading reflectively, and specifically about reading Buddhist texts. Ratnaguna discusses preparing ones state of mind for reading, and the importance of ‘living with a text’, reading slowly and trying to penetrate deeply into its meaning, letting that meaning unfold over time. He explores how to read a Buddhist text with critical appreciation, especially how to get beyond the limitations of translations, which inevitably are interpretations of the original. Chapter Five is on ‘imagining the Buddha’. In this Ratnaguna explores the practice of reflecting upon, and imagining, the qualities of the wise. From there he discusses how contemplation develops out of such imaginative reflection. He makes the point that the use of the imagination in this way helps develop contemplation, using the whole of our being. He explores the inter-relationships between faith and imagination, and between wisdom and love. In Chapter Six he moves specifically to the practice of contemplating reality. He discusses meditative absorption and its helpfulness for contemplation, but also mentions that reflection on aspects of reality can help the development of such absorption. He explores how contemplation is an ‘ingathering’ around a topic, and is akin to a state of ‘flow’, in which the self is forgotten and one is fully engaged, bodily as well as mentally. Ratnaguna then discusses impermanence, as an aspect of reality that is very productive to contemplate. He finishes by looking at some of the results of such contemplation, and how to bring the insight one gains effectively into ones life. Overall the book is a very helpful guide, perhaps unique, on how to develop the art of reflection and then from this develop contemplation. Ratnaguna has the knack of approaching complex or difficult issues and making apparently simple but not so obvious points that elucidate matters. In doing so he discusses spiritually vital practices that might just not occur to people. Thus he emphasises the important art of doing nothing as a basis for reflection. He discusses ‘talking to oneself’ in a manner that is actually a rigorous and honest debate that deliberately challenges ones own assumptions. He looks at owning up to one’s own foolishness, and other difficult aspects of self-reflection. Such practices can be crucial in the cultivation of ethics, psychological integration and wisdom. The fact that Ratnaguna explicitly discusses them, and recommends them, is likely to be of much benefit to people. Though I found the book a joy to read I must ask (perhaps following Ratnaguna’s advice on debating with oneself) whether there are any improvements that could be made to it. The only chapter in which I think improvements might be made is Chapter Six, the chapter on contemplation. Ratnaguna mentions the Buddha’s recommendation about progressing through the four rupa dhyanas and then coming to the first, in order to contemplate. This can be off-putting for many people because, as he discusses, people’s experience of dhyanas can be very limited, especially when not on a meditation retreat. However the experience of access concentration is more attainable, and it does represent a deeper level of ‘ingatheredness’, a level which can be used to contemplate or to reflect deeply. Perhaps Ratnaguna could have discussed access concentration explicitly, and also clarified the difference between access concentration and first dhyana. He does however emphasise that concentrated states of mind are achievable, even by schoolchildren attempting meditation for the first time, and that such states can be used for contemplation. Also, a question for me is the meaning of the terms ‘vitarka’ and ‘vicara’. There is one traditional interpretation of these terms, as ‘initial thought’ and ‘sustained thought’, which nevertheless describes them as what are actually initial and sustained attention. Ratnaguna follows this interpretation to some extent. However one could argue that vitarka and vicara are really aspects of skilful thinking, and therefore precisely what his book is about. Given that they are ‘dhyana factors’ the implication is that reflection not only facilitates contemplation but also deep concentration – and, as Ratnaguna mentions, reflection on aspects of reality can bring about dhyana. Ratnaguna also mainly discusses the contemplation of impermanence, rather than other aspects of reality, such as emptiness. It is maybe a personal matter which aspect of reality on which to focus reflection and contemplation, and he states that his preferred contemplation is on impermanence. It is also probably for many people an important starting point, but perhaps something could have been written about the reflection and contemplation of emptiness. However, notwithstanding these suggestions, this book is a very useful and delightful guide to the art of reflection, which I thoroughly recommend to all Dharma practitioners. As I write this, the snow is falling outside the window, and leaving a tablet of pure white on the grass. Reflecting on Manjusvara's new book about writing and the spiritual path, The Poet's Way, I immediately think of the blank white page that the poet or aspiring writer must face before setting off on their journey. For some this white page may be terrifying, for others exciting, and for many both of these things, representing as it does the unknown, the not yet come into being. If I were to be setting out into the unknown through the snow, or through facing a blank page for the first time -and it always feels like the first time, indeed is new and unique each time - I would like to have the voice in my ear of someone who has already travelled the way. A voice that is friendly, accessible, straightforward, authentic, and which seems to be speaking specifically to me. A voice which also communicates that spark of magic that is in all creative enterprise. Manjusvara's voice is just like this throughout this simple yet profound book: a voice that is trustworthy and intimate, humorous, enthusiastic and never patronising. Whilst reading the book I also felt the generosity of someone who was willing to share the tools of his trade in detail and without jargon, what he has learned through hard work along the way, both as a poet and experienced Dharma practitioner. The first four chapters explore what a poem actually is and how it works to transport us from one realm of a more ‘mundane’ reality, to a deeper and more meaningful experience of the world and ourselves. He explores particularly the special use of language that is employed in poetry and how this changes our consciousness, if we allow it to. He also introduces many engaging examples and stories throughout the book to illustrate his points. Each chapter ends with an exercise that helps us to tap into this experience for ourselves. 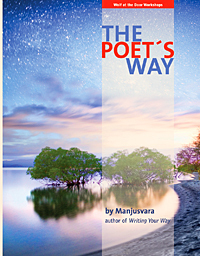 Manjusvara's take in both this work and his other book, Writing Your Way, is fairly unique in discussing the process of writing poetry within the more holistic context of an attempt to live life consciously and ethically. After chapter four Manjusvara goes into more precise detail about the craft of poetry. One highlight for me was Manjusvara's exploration of forms and line breaks in chapter five ‘oblongs and squares’ in which he explains very clearly – and shows by giving examples – the different effects of breaking lines in different places. I don't think I've read a more accessible and enjoyable account of the importance and significance of enjambment and where the poet breaks the line. I also particularly enjoyed chapter nine, Knowing when to stop, where Manjusvara again describes in detail the process he went through in writing a poem, the different decisions he made along the way, and why. Amongst other aspects of the craft of poetry Manjusvara discusses sound, rhythm and rhyme (which as a trained composer he is well qualified to discuss), different poetic forms, and shapes of poems in general. What is particularly helpful is that he always explains in very clear language the effects of different aspects of the poem, how and why they work. Reading this book for me was like entering an ocean. The entry seemed gradual and straightforward, but seemingly without effort or difficulty I found myself having been guided surely and steadily to deep places where inspiration and treasures were generously offered. I would recommend this book as a great and uniquely accessible guide for anyone sincerely wishing to understand and write poetry, especially where they value reading and writing as a means towards greater sensitivity and awareness of self and world. Have you ever wondered how those tribes in the Amazon feel about being studied by anthropologists? I gained some insight into what it must be like while reading Sally McAra’s new book, as I took part in many of the events that form the basis of her study, and was one of her informants as well. For those unfamiliar with contemporary anthropology McAra’s open discussion of her involvement in the Friends of the Western Buddhist Order (FWBO) Sangha and their stupa building project, as well as her personal exploration of Buddhism as a spiritual path may come as a surprise. The book emerged out of her involvement rather than the other way around. Sally says “even after deciding to undertake this research in 1999, I attended retreats and talks more as a participant than observer” (p.9). While it is underpinned by reference to anthropological theory throughout, there are also her subjective observations and personal responses to what she was observing. In the same way I find myself torn between adopting the usual impersonal academic tone by referring to my friend as “McAra” or “the author”, when we have been friends for many years and the subject matter itself is intensely personal for me. In the spirit of Sally’s openness I must confess before proceeding that I have no background in Anthropology and cannot begin to critique this book on the terms on which it was written – it began life as a master degree thesis in Anthropology. The FWBO have been active in New Zealand since 1971. The dream of owning a bit of land and going there for holidays is part of the New Zealand way of life. The land that became known as Sudarshanaloka – the Land of Beautiful Visions – was bought in 1993 by the FWBO with the intention of creating a place of retreat. The original idea had been to build a large retreat facility but soon the focus changed and what got built was a 7m tall stupa. The fundamental question that Sally addresses is ‘what did a group of descendants of British settlers think they were accomplishing by building a huge white concrete monument in the “clean green” bush in New Zealand in the late 1990’s.’ The book is structured around the idea of a “conjuncture” in which various somewhat disparate factors come together to create a crisis that is resolved by a re-visioning of the situation in positive terms. The stupa emerges out of this re-visioning and becomes a symbol of it. McAra highlights the poignancy of the descendants of colonists struggling for a sense of identity and belonging – something I feel very keenly. I am quoted in the book as saying that living in England I am a foreigner, despite having English ancestry. But I am not an indigenous person in New Zealand either, and have often been in literal conflict with the Māori who are. Convert Buddhists, such as we are, bring another foreign element into the mix – an Asian religion and culture foreign to our peers. To some extent Buddhism provides a sense of identity and a lineage in which we can be rooted. However as Sally reminds us the FWBO is a radical Buddhist movement, which sees itself as the beginnings of an alternative “new society”. There is tension here between the narratives of place and the narratives of separateness, and these find some resolution for the informants in the creation of a “spiritual home” at Sudarshanaloka. The story is largely told in the voices of three people: Diane Quinn (now ordained as Prajñalila), Taranatha, and Satyananda. These three were trustees of the trust that owned the land, and Satyananda lived in the old farmhouse on the land. They were chosen as the main characters because their “accounts provide the most telling insight into how personal engagement with the land became an essential part of the story of transforming self and place“ (p.12). Sally often chips in with her own reactions to what is being said, or with comments on her interpretations of event, which helps to make us aware of her presence as anthropologist, as a special kind of observer, not wholly caught up in the process as her main informants generally are. While the main informants seem to offer an internally coherent story about the project and its aims, less central informants, such as myself, are more likely to be sceptical about the unfolding narrative when they come into it. Within the overall metaphor of the conjuncture Sally examines the role of three symbols which index the various ideas and myths which go to creating the sense of place and purpose at Sudarshanaloka. The stupa itself, an old pūriri tree, and the charred remains of a once great kauri tree. Initially it is the pūriri tree that is the focus of the group’s attentions in creating a sense of a sacred place. A Buddhist shrine is installed under it, claiming the land for the Buddha so to speak. This creates a tension that is narrated as a sense of unquiet or a felt presence that is somewhat hostile, though not perhaps malevolent. Along with the death of Denis – an important early team member – this tension creates the conjunction, the subsequent re-envisioning of the land, and our relationship with the land. The Buddha figure is removed and placed in the stupa, while a “pagan” shrine is left in its place. The old kauri log is initially given an air of taboo. I would have sawn it up and sold the valuable wood, but order members encouraged me to think of the stump more symbolically. The log represented the past, rather rapacious, attitude to the land that has been exploited for gold, timber, and then farmed. By preserving the stump a symbol was created to express the desire to relate more sensitively to the land. Ironically in revisiting the land in 2003 Sally is surprised, as I was, to find the story about it has shifted. The log had in fact been sawn up into timber, some of which was turned into bowls and sold. The stupa of course is at the heart of this story. Seventeen tons of concrete, startling white against the dull green of the New Zealand bush around it, or the blue sky above, who would have thought of making something so useless in pragmatic New Zealand? The decision to build a stupa instead of a more utilitarian structure – such as a retreat hut, or the planned retreat centre – is the more important aspect of this story. Sally dwells on the significance of the stupa as a Buddhist symbol, but also on the identity of the stupa with the relics of the person interred within it. In this case the stupa houses some of the remains of Dhardo Rinpoche, one of the teachers of the Sangharakshita, the founder of the FWBO. Traditionally the stupa invokes the presence of the Buddha or some important Buddhist saint, a very important aspect of Buddhist practice across most traditions. For many FWBO Buddhists the stupa is Dhardo Rinpoche. However as Sally brings out, the stupa is also a symbol of occupation, a proclamation of the FWBO presence at Sudarshanaloka. The over-all approach of the FWBO at Sudarshanaloka can be characterised as bricolage – a term that has negative connotations in some contexts but which is not intended as pejorative. It refers to a quality of eclecticism in the approach which draws on Buddhist mythology and custom, Jungian psychological discourse, Neo-pagan narratives, and even traditional Māori myth and custom. The Buddha did say that whatever conduces to liberation is the Dharma, and it seems that the FWBO have interpreted this very liberally. Sally nicely balances her various roles as participant, observer and commentator. The use of jargon is comparatively light and it is always well explained so that the book is perfectly comprehensible without a degree in Anthropology, though the primary audience is undoubtedly academic. Despite the thread of critique that runs through the book it is obvious that Sally has many sympathies with the FWBO in New Zealand, and with what was being attempted at Sudarshanaloka. At the time I was not aware of Sally as a special observer. As she notes in the book however, many people who attended the stupa consecration ceremony were standing back taking photos rather than being wholly “in” the ritual, as though they were documenting it. So perhaps an Anthropologist would not have stood out. Reading Sally’s account was a powerful evocation of the times, and of my own involvement in Sudarshanaloka. I found Sally’s commentary caused me to reconsider some aspects of the story. I suspect I rather naively took on many of the attitude of those in the lead without much critique. I have never known what to make of talk of “spirits” residing in trees for instance. It is a common enough belief in rural India, even today, but does it have relevance in 21st Century New Zealand? The three main informants for the book present a remarkably coherent and internally consistent story about what was going on. To the extent that I did not accept such stories, I was an outsider also, but was attracted by the idea of a “special” place. It made me aware of the tension that I often feel as a Buddhist between the superstitious elements of the religion and my education in the sciences. There are one or two subtle points that are missed by McAra’s account. 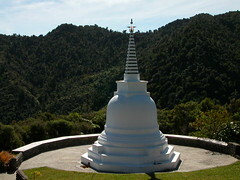 For instance it is clear to me, having recently been through the same process, that Taranatha is strongly influenced by the rituals created for the men’s ordination retreats at the Guhyaloka Retreat Centre in Spain – also an isolated valley, and also the site of a stupa containing some of Dhardo Rinpoche’s relics. It might have been interesting to explore the parallels between the valley where Taranatha was ordained and where he was making his spiritual home. This is a valuable book. It is beautifully presented in hardback on acid-free paper. Photographs in the text have reproduced well. It is a public and authoritative account of the project that absorbed so much time, energy and resources for the New Zealand FWBO Sangha. It also gives us a different view of ourselves – not entirely outside, but definitely reflective and seeking to make sense of observations in the broad context of anthropology and it’s theories. By referring to these academic norms it will allow others to appreciate more fully the New Zealand situation, and the difficulties faced by settler communities. Despite the evidently unequal power relationships with indigenous people, we settlers do not feel very settled as yet. We are left with a powerful longing for belonging. Land of beautiful vision : making a Buddhist sacred place in New Zealand. Honolulu : University of Hawai’i Press, 2007.